It looks like this move thing is really happening. The house is a disaster! There are boxes everywhere and furniture is getting moved around. It is so hard to imagine that this will actually take place in just 2 1/2 weeks! How can everything possibly be done in that amount of time? I’m supervising, of course, but it seems mom is just not moving fast enough! The cat room is completely torn apart. The cat room was a wonderful place. It is where mom kept the foster kitties when they first came to stay with us. There were some large wire crates in there for kitties that needed to have movement restricted after surgery or for any other reason that they needed to be confined. There were great cat trees and a comfortable chair. We got to go in when there were no kitties in it or the kitties were allowed in the whole house. Well, that is no more. The room has been gutted and it is now a storage room for the boxes that will be loaded on our moving truck. One of the good things about the cat room destruction is that mom found a whole box of toys she forgot she had. 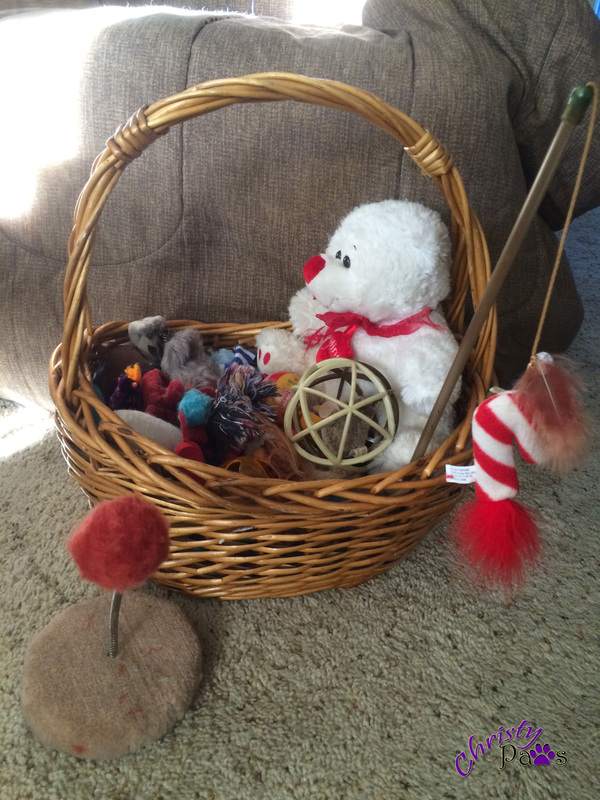 We have a whole basket of toys but you can never have enough, right? Hey, wait. You’re putting the lid back on the box. What do you mean, we’ll get some of this unexpected treasure after me move? I can’t imagine how many toys mom is going to find when she moves more of the furniture. I don’t know about your house, but here, toys hardly ever get thrown away, new ones get added but the overall number never seems to change much. 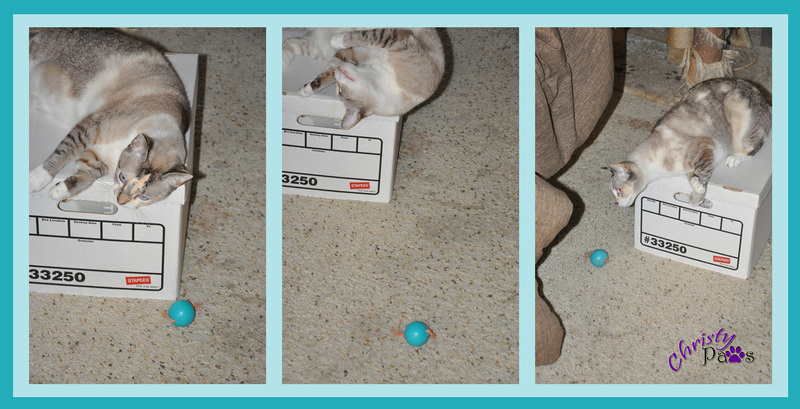 I was having a great time playing with this ball she just found in the cat room until the camera came out. Then I had to play coy! Well, friends, I’ve told mom she has to get back to work. I’ll let her take a few breaks but we have to keep a move on. We’re on a deadline! Tagged big change, cat, cat toys, moving. Bookmark the permalink. What fun finding treasures! Hope the preparations continue to go smoothly! Looks like you’re doing a great job helping your mom pack. And it’s good that you’re rounding up all the toys. You wouldn’t want to leave any behind. How fun, it is like getting new toys. That’s even better than moving the sofa and being able to get at all of those toys that vanished under there. Score! It’s always fun to find “new” toys, isn’t it? How exciting it will be to have a new home with new spots to nap and hide your toys from your Mom! Oh boy – – moving means lots of boxes to snoop in. Moving is a big job for the humans. M says after living here for 40 years now, she not about to move anywhere until they drag her out! he he She is starting to clean out closets tho and donate stuff she can’t wear anymore. That’s a start. We’ve never moved so we can only imagine all the fun you’re having with all the boxes and all the “new” toys you’ve found. Oh Wow BOXES. What a time yous gunna hav. It’s sorta like weez moved too since ow old pawtment wuz wedun and mommy has to unpack evewyfin’ again. Weez can’t wait to see yous new home too. Weez’ll be showin’ off ow new places at da same time it sounds like. Cuz meez mommy ain’t movin’ to quickly these days. MOL Hav fun.